It is still dark when Dean Zeller pulls into the first parking lot at Presque Isle State Park on what will eventually dawn as an overcast and rainy Wednesday. 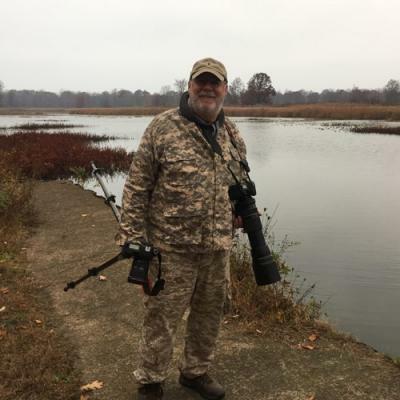 He's got a cup of coffee in his new Honda CRV – recently replacing an old Caddy with about 200,000 miles on it – and is dressed in a camouflage jacket and pants. This is where I meet him at 6 a.m., before we begin his route around the park capturing the moon, stars, and wildlife native to the 3,112-acre natural peninsula. Normally the passenger seat serves as resting place for his Canon, which on a good day will capture 1,000 images. The moon was full the night before, and the stars are now hidden behind the clouds, so there won't be any of Zeller's magical morning posts to his 1,300 Facebook followers. We pause at the second parking lot, facing the lights of the city of Erie, and Zeller reaches for the camera and uses the industrial skyline to adjust the focus. "You can take pictures in the dark that look like they were taken in the day," he says. "I like the way the colors come out in the dark." 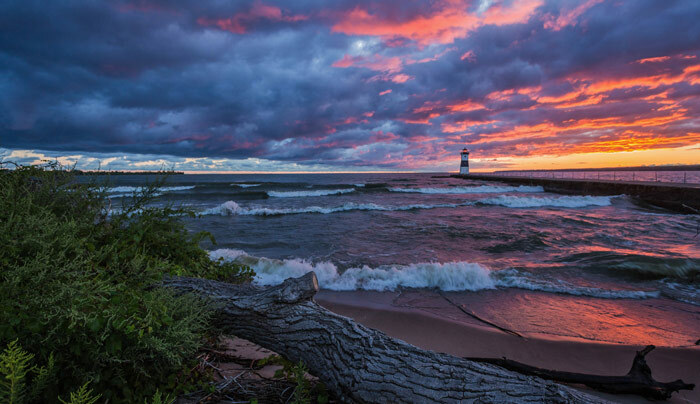 Dean Zeller, 64, is a self-taught photographer who captures Presque Isle for his Facebook page every day. 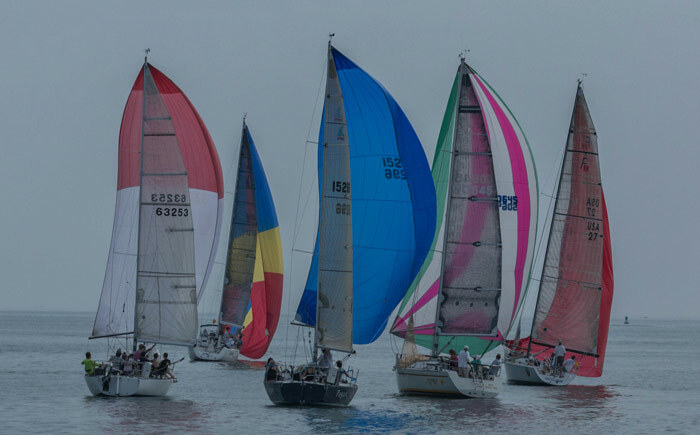 He grew up at Fourth and Maryland streets, and spent a lot of summers at the Erie Yacht Club, where he learned to sail. He is a lifelong fisherman, now practicing catch and release, and carries his poles in the backseat of the car. "I was a big fisherman all of my life. I started taking my camera with me," he says. "I always went out early and starting taking pictures at sunrise." His first photographs were made using disposable cameras, which had to be taken to a photo developing center to be printed before he could see what was captured. He later moved into a digital camera, teaching himself about shutter speeds and aperture via YouTube. "I wanted to take pictures of the moon with fireworks," he explains. He needed a tripod and remote to do that, to control the shutter speed. By now, he has watched 1,000 videos. "The more you do something, the more you learn." After retiring from Roth Cadillac, Zeller began his solitary treks to Presque Isle in the morning. About four years ago, he started using Facebook to share what he saw. Each sunrise that bursts forth with reds and golds is no longer a vision seen only by the early risers among the county's residents. The most inspirational of his photos – often associated with a birthday message – are posted after he leaves the park each day around 10 a.m. He also maintains a website, deanzellerphotography.com, where his photos are for sale. Even in the worst weather, Zeller will be out cruising the 13 miles of paved road and 21 miles of trails. 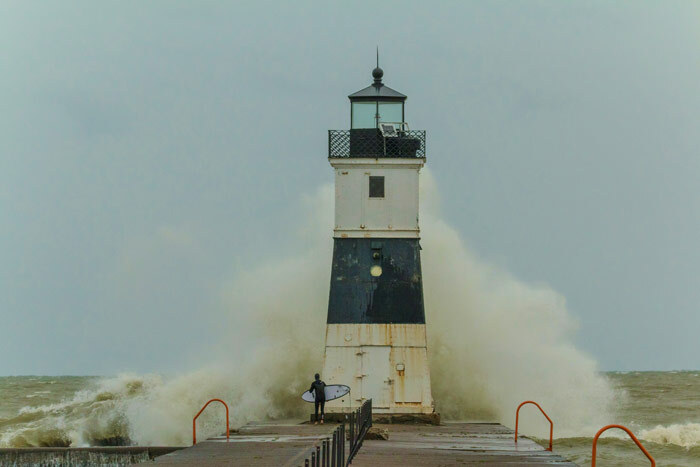 "Sometimes when the weather is bad, you might get really good photos ... of people surfing, of waves crashing against the lighthouse. You never know what to expect over the lake." As magical as the sunrises are, his followers have come to expect updates on the wildlife that make their homes at the park. On this morning, we're not seeing much wildlife, in part because it is duck-hunting season. Every now and again shotgun blasts ring out. It's a bit unnerving to be traveling the park's trails, staring at strings of duck decoys and knowing that behind the nearby blind is a hunter with a loaded gun. Indeed, Zeller reports that he has been sprayed by stray shot. "I'm against hunting out here," he adds. "It should be a sanctuary." We pull off the side of the road and walk with camera and tripod along Long Pond Trail, which is carpeted with fallen leaves. The rain hasn't started yet, so our steps are being announced to any creature resting after an evening of hunting. Suddenly, a large brown bird the size of a football rises from a treetop and flaps away. Zeller explains that we've just scared off a great horned owl. Clearly this wouldn't have happened if the photographer had been alone. We make our way to the pond, which is among his favorites. A few blue herons and some gulls are all that we see on this morning. We head back to the car and continue along the route, eventually turning past the outermost point and back along the Lake Erie side. Zeller is scouting for his friend, Pat the coyote. 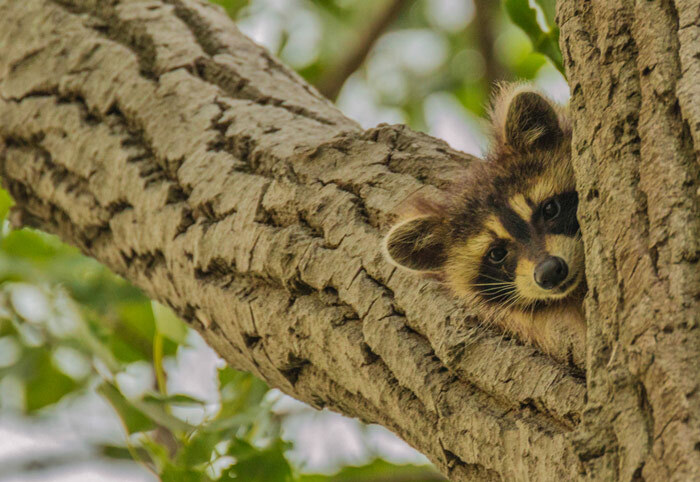 He refers to several animals that he sees frequently as friends, including Mikey the American mink and Bandit the raccoon. His relationship with the animals sparks online conversations about his familiarity with them, but Zeller is quick to note that he does not feed these animals nor treat them as anything but the wild animals they are. 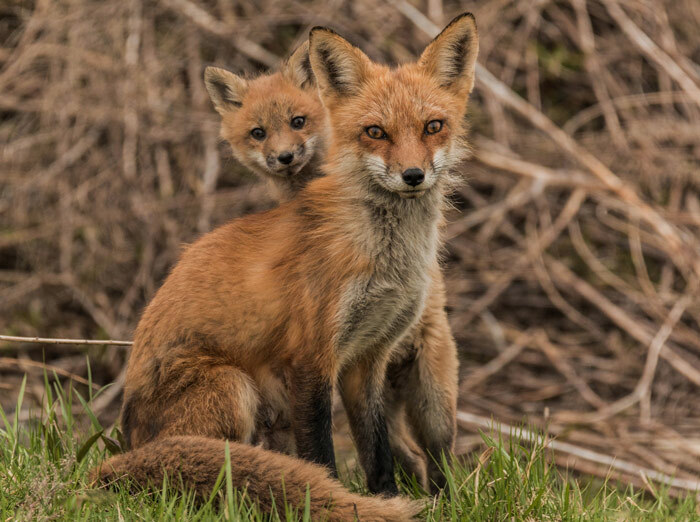 They become as familiar with his daily movements at the park as he does with theirs. Zeller has been following, or has been followed by, Pat for three years. "At first, I would scare him and he would run away," he says. "After a while, he became more accustomed to me. One time, I hiked to take a picture of a tree I liked. It was 5 a.m., winter, and I was taking pictures of stars by this tree. As I walked by my car, I felt a presence. It was Pat. I started talking to him. He walked back to the car with me. I guess it was a building point in our relationship. He knew I was not a threat. I would not chase him or go after him. After that, every time I saw him, he would walk up to me. I would sit down and he would sit down." It has been a couple of weeks since Zeller has seen Pat, and he's worried. His last photos of the coyote showed a healthy young male whose winter coat had come in. 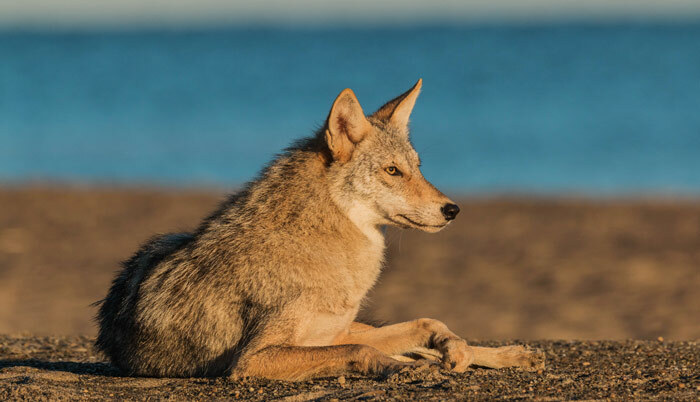 This isn't the first time the coyote has disappeared, but Zeller is concerned he has died – a victim of the parasites that can inflict wild animals. Perhaps, he speculates optimistically, the duck hunting altered the coyote's habits. "I can't tell you what it is like to be around a wild animal like that and have it comfortable enough [to not run away]," he says. We move on in search of snowy owls, which can be spotted along the breakwaters and beaches starting in November. The wind has picked up and now the rain has started. A scan of the beach reveals no owls. A few minutes later we pull up to Fox Trail, where Zeller gets out of the car to walk under what's left of the canopy on a tree where owls nested this year. The owls are long gone, and he wonders if they will return in 2017. The nesting tree was close to the trail, and, at times, small crowds gathered to gawk at the owlets. Further searches for Bandit and Mikey have similar results. The creatures of the park have taken shelter from the weather. We soon do the same. Zeller typically wraps up his morning around 9:30 or 10 a.m., and then heads to visit his 91-year-old mother. After that, he has lunch with his wife, Susan, and then posts his pictures. "One of the reasons I do what I do is for people who can't get out and experience our park," he explains. "I am out every day walking in nature. And, to top it all off, I've got all these people with me. It brings so much joy to other people." Marnie Mead can be contacted at marnie@marniemeadmedia.com and you can follow her on Twitter @makeiterie.